NEW ORLEANS – A local Abbey of the Benedictine Order of the Catholic Church won the right to build and sell simple wooden caskets after a years-long court battle with the state government. The U.S. Circuit Court of Appeals for the Fifth District upheld a lower court’s ruling in a strongly worded opinion published Wednesday. St. Joseph Abbey and its employee Mark Coudrain originally filed suit against the members of the Louisiana State Board of Embalmers and Funeral Directors in August of 2010. In 2005 Hurricane Katrina destroyed much of the timberland that had been the monk’s principle source of income. Seeking another source of revenue to cover the monks’ medical and educational costs, the Abbey decided to begin marketing its cypress caskets, traditionally used to bury monks, to the public. They invested $200,000 in St. Joseph Woodworks, to be managed by Mark Coudrain a deacon and employee of the Abbey. The monks make two types of caskets, monastic and traditional, that retail for $1,500 and $2,000 respectively. These prices are, according to documents in this litigation, are well below those offered by funeral homes which generally sell caskets marked-up and coupled with non-declinable service fees. The State Board of Embalmers and Funeral Directors sent the Abbey a cease and desist letter and when the Abbey did not respond within a month, the Board initiated a formal complaint. In 2008 and 2010 the Abbey petitioned the state legislature to change the law to allow non-profit groups to sell caskets. Two bills to amend the law were drafted, but none made it out of committee, although they were unopposed by the public. The Abbey and Coudrain then filed suit. Under the Louisiana law in question, intrastate sales of caskets may be made only by a licensed funeral director at a licensed funeral home. The Board claimed that economic protection of a particular industry is a legitimate state interest and further that the requirements are “rationally related” to public health and safety and consumer welfare. The panel held that the Unfair Trade Practices and Consumer Protection Law already protects consumers from predatory sales techniques including any used by intrastate casket sellers. 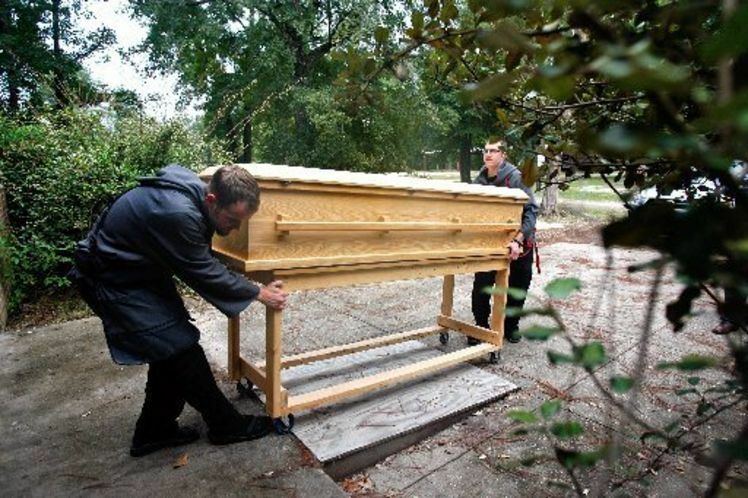 Furthermore, because Louisiana does not require a person to be buried in a casket, does not require a casket to be sealed before burial and does not require funeral directors to have special training in caskets, the court finds that there is no rational relationship between health and safety concerns and limiting intrastate casket sales to licensed funeral homes. The court affirmed a district court’s ruling, saying that the State Board of Embalmers and Funeral Directors failed to offer a rational basis for the rule the monks challenged. According to NOLA.com, in 2004 the 10th Circuit Court of Appeals upheld a law similar to the one struck down in this case. This leaves an opening for the U.S. Supreme Court to decide the issue, should the Board appeal.